Synopsis: In Neustadt prison, mad scientist Dr. Niemann and his hunchbacked assistant Daniel are unexpectedly freed when a wall of their cell collapses during a violent thunderstorm. The two happen upon Lampini's traveling horror show, which boasts as its main attraction the skeleton of Count Dracula. Neimann and Eric quickly murder Lampini and his driver and take their places. Niemann has been obsessed with proving the genius of Dr. Frankenstein and he sets out to the village where the Monster was created. Niemann discovers that the skeleton of Dracula is authentic when he removes the stake that had been thrust through the vampire's heart. The skeleton promptly transforms into the Count. Threatening to replace the stake if Dracula doesn't do his bidding, Niemann sends the vampire out to kill the three men who had him imprisoned: Strauss, Ullman and Hussman. Dracula kills Hussman but dies before he can dispense with the hated Strauss and Ullman. Reaching the village of Vasaria, they encounter a band of gypsies. Seeing a gypsy woman Ilonka being abused, Daniel saves her and, smitten with her, asks her to join them. Aw, who the hell am I kidding? It's a Frankenstein movie, okay? There's a wolf man! And a mad scientist! And a really lazy, ineffectual Dracula! If you're looking for more than that, you're barking up the wrong tree. Really, if there is any moral to be found at the heart of House of Frankenstein, it is this: everyone should be happy with their own brain. Everybody is lusting after somebody else's brain in this movie, and it actually made me very sad. 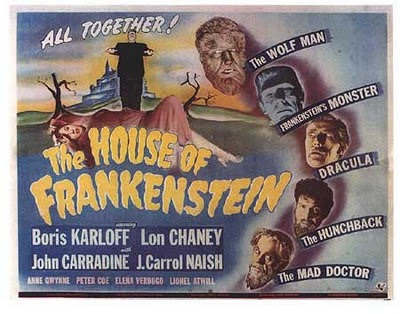 House of Frankenstein is generally better-regarded than its predecessor Frankenstein Meets the Wolf Man, but I'm not sure why; there are too many characters here and altogether too much going on. 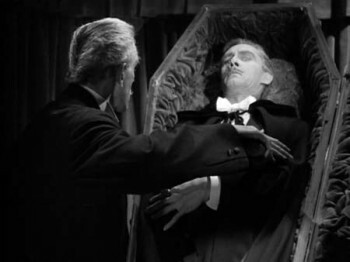 Dracula appears early on and is killed off too quickly and too glibly. In fact, Dracula dies before any of the other monsters are brought into the story. For this reason the movie is often described as "episodic", but the plot actually holds together fairly well once the Dracula subplot is (rather unceremoniously) dispensed with. Interestingly, having Frankenstein's monster -- essentially a science-fiction element -- occupy the screen with supernatural things like vampires and werewolves seemed more jarring in this movie than in Frankenstein Meets the Wolf Man. This might be because Siodmak's script for the earlier film introduced the Wolf Man first, and from there led Dr. Mannering to Baroness Frankenstein and the perversion of science that her family created. But this movie gives us the science first, and Dr. Niemann (a scientist, though admittedly an unconventional one) doesn't seem to be particularly surprised that the Dracula skeleton in Lampini's collection is imbued with supernatural powers, or that Lawrence Talbot is really a werewolf. The cast is generally pretty good here, with Boris Karloff showing a sinister charm as Niemann. I particularly liked his conversation with Lampini in the trailer -- he imbues the character with an ironic sense of detachment, an interesting note added to a fairly straightforward mad-scientist role. Lugosi was originally slated to reprise his Dracula role, but (in one of those little Hollywood ironies) he had committed to appear in a touring production of Arsenic and Old Lace, as Jonathan Brewster, the role originated by Boris Karloff. This is too bad, because without Lugosi, the role goes to a surprisingly laconic John Carradine, who plays Dracula as if he were a two-bit riverboat gambler. Lon Chaney, Jr. seems oddly distracted, as though wondering how many more of these movies he's going to have to do (answer: not many). Ann Gwynne, as the spunky, fast-talking American gal, seems to have breezed in from a Howard Hawks picture. J. Carrol Naish has the most interesting performance, as the tormented hunchback Daniel. How hunchbacks became a desirable accessory for mad scientists is beyond me, but in the 13 years since the original Frankenstein they are apparently a requirement. Daniel gets the most poignant story and as a result, is rewarded with the most tragic death. The truth is, all the principal characters are killed in quick succession during the last two minutes of the film, apparently in a desperate attempt to tie up loose ends. House of Frankenstein doesn't work well, but the plot is so overloaded that, really, you're amazed it works at all. HOUSE OF FRANKENSTEIN is simply a rollercoaster ride featuring the finest cast ever assembled for any Universal horror film. Karloff was at a low ebb, in just his second feature since returning to Hollywood after Broadway success in ARSENIC AND OLD LACE, who would soon find solace in collaboration with RKO's Val Lewton. J. Carrol Naish, a memorable ape man in 1942's DR. RENAULT'S SECRET, again manages to earn sympathy despite his many victims, and Elena Verdugo makes a vivacious presence out of a cliched role. John Carradine's Dracula has received higher praise than Lugosi's in some circles, but the one major fault is the distinct lack of menace that even Chaney had (resembling an undead version of Hatfield in 1939's STAGECOACH, his vampire was ridiculously easy to dispatch). Chaney is still able to provide a few good moments, but Glenn Strange's Monster, which could have been the best post-Karloff, is reduced to a minor tantrum saved for the final curtain (the aging Lugosi's Monster was far more active). What was the point of signing a rugged, capable type to provide all the physical prowess his predecessor lacked, and barely utilize him at all?